KIEV, Ukraine -- Ukraine's education minister is in hot water after saying that women at the highest levels of study in the country's university system are less attractive than other Ukrainian women. Ukrainian Education Ministry officials try (and fail) to mollify female protesters who were angry about comments by the education minister Dmytro Tabachnyk, who said said female university students were not as attractive as other women. Dmytro Tabachnyk said last week that the country's better graduate and post-graduate students "are girls who have a less bright, less attractive, and less model-like appearance." 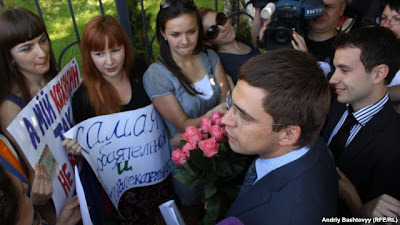 A group of about 10 women who are graduate students or doctoral-level students at Ukrainian universities gathered in front of the Education Ministry in Kiev on May 21 to complain about Tabachnyk's statement. The women -- students of fields such as law, medicine, and education -- dressed in long gowns for the protest and carried placards saying "I read that I am ugly!" Each also held a university diploma to prove that they had obtained a four-year university degree in Ukraine. The women demanded that Tabachnyk either apologize for his remarks or resign from his cabinet post. Tabachnyk refused to meet with the women. But three men with lower-level posts in the ministry emerged from the building with bouquets of flowers during the demonstration, telling the protesters that they were, indeed, beautiful. The women refused to accept the flowers, saying they wanted Tabachnyk himself to apologize personally. Earlier, Prime Minister Mykola Azarov took steps to distance himself from Tabachnyk's comments by posting an apology on his Facebook page. He said the education minister probably was "tired at work" when he made the remark. Tabachnyk himself has the title of professor and the equivalent of a doctorate degree in history. He is currently a member of Ukraine's Academy of Legal Sciences. Since his first week as Ukraine's education minister in March 2010, Tabachnyk has faced calls to resign from protesters that have included students at the Ukrainian Catholic University as well as members of the opposition Forward, Ukraine! party. For years, those groups have accused Tabachnyk of "openly and publicly humiliating" Ukraine's intelligentsia, denigrating Ukraine's culture and language, and trying to vindicate the regime of Soviet dictator Josef Stalin. Ukraine's President Viktor Yanukovych shocked a luncheon at the World Economic Forum in Davos, Switzerland, in January when he told investors that they should visit Ukraine in the spring "when it gets warm and women in Ukrainian cities begin taking off their clothes." Yanukovych told the gathering "You will see such beauty! It is very beautiful!"